Hersonissos (Λιμένας Χερσονήσου) is situated on the north coast of Crete in the district of Heraklion. The modern resort of Hersonissos is situated to the east and west of the Port of Limenas Hersonissos and stands on the site of an ancient seaport bearing the same name. The village of Hersonissos itself is a short distance inland. Limenas Hersonissos is one of the most developed tourist resorts on Crete and very popular with tourists from Northern Europe. The name Hersonissos means 'peninsula' in Greek. A wide range of accommodation is available. Hersonissos has many facilities for eating, drinking and nightlife. 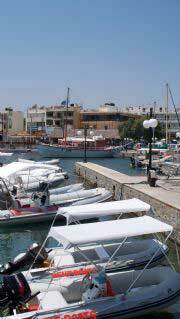 Facilities for yachts and small boats are available at the harbour. The beaches are listed from West to East. A wide rocky beach with sparkling clear water,close to the naturist beach. It can be affected by the Summer north winds. It is ideal for snorkelling. The beach has no facilities of its own but the Hersonissos tourist resort is very near and has everything you need for food, drink and accommodation. A rocky beach with some sand. This beach can be affected by the Summer north winds. Clear parkling water ideal for snorkelling. The beach has no facilities of its own but the Hersonissos tourist resort is very near and has everything you need for food, drink and accommodation. This is the only beach at Hersonissos which allows nudism. Limanakia beach is a series of small sandy beaches with sparkling clear water. They are quieter than the beaches in the centre of the resort. They can be affected by the Summer north winds. The beaches have no facilities of their own but the Hersonissos tourist resort is very nearby and has everything you need for food, drink and accommodation. A long sandy beach adjacent to the town of Hersonissos. The largest of the beaches at Hersonissos. It is affected by the Summer north winds. A popular and busy beach with facilities for food and drink, sunbathing, swimming and sea sports. Accommodation is available. A popular and busy beach adjacent to the town of Hersonissos. The beach is affcted by the Summer north winds. It has facilities for food and drink, swimming, sunbathing and sea sports. Accommodation is available. Several tiny sandy beaches. These beaches are affected by the Summer north winds. They have no facilities of their own but the Hersonissos tourist resort is very nearby and has everything you need for food, drink and accommodation. A sandy beach east of Hersonissos. It is affected by the Summer north winds. The beach has no facilities of its own but the Hersonissos tourist resort is very near and has everything you need for food, drink and accommodation. Several small pebble beaches between Star Beach and Nana Beach near the Lychnostasis Museum. A sandy beach east of Hersonissos and adjacent to the beach above. It is not affected by the Summer north winds. Several freshwater springs in the area make the water here quite cold. The beach has no facilities of its own but the Hersonissos tourist resort is very near and has everything you need for food, drink and accommodation. A sandy beach east of Hersonissos. The beach is not affected by the Summer north winds. Facilities for swimming, sunbathing and sea sports. Accommodation is available. Hersonissos has a long and interesting history and much of its past can be seen in ancient remains around the resort and near to it. Located at the west of the port near the Church of Agia Paraskevi. Hersonissos stands on the site of the port of the ancient city of Lyktos (Lyttos), the Dorian centre of Crete. Local tradition believes this city was founded by the Etruscans. On the coast one kilometre to the east of Hersonissos was an ancient temple dedicated to the goddess Vritomartis which supports this idea. The town flourished under Roman occupation. The Romans constructed a number of important buildings including an aqueduct, an amphitheatre, the harbour, marble waterfalls and a fountain. The Roman fountain has survived. Its mosaics depict fishermen from the period. It can be seen near the eastern part of the harbour. Other Roman remains still visible are the ruins of dwelling houses and the Roman mole of the harbour. The Roman quay is on the east part of the harbour and it is now partially submerged. On the northeast of the peninsula cuts in the rock have been identified as Roman fish tanks. A Roman fort used to stand on the east of the peninsula above the church of Agia Paraskevi in the area called Kastri which still has some Roman remains. Ruins of the aquaduct can be seen at Xerokamares, near the village Potamies. Areas with Byzantine remains are Kastri and around the port. The remains of an Early Christian Basilica can be seen on the promontory above the town at Kastri. The three-aisle Basilica is the burial place of many eminent clergymen and martyrs. Mosaics dating from the 6th Century can still be seen. The old port of Hersonissos fell into decline due to raids by pirates and became little more than a small fishing village. This resulted in the city being relocated inland, where it stood on the hilltop just south of the port. Today, Old Hersonisos as it is called to distinguish it from the modern tourist resort is one of the oldest villages on Crete. It maintains its character and in 1978 the village was declared 'traditional' due to its well preserved features. Two-aisle church on the promontory west of the town. The church is dedicated to two saints, Aghios Georghios (St George) - south aisle and Aghios Nikolaos (St Nicholas) - north aisle. Church of Aghia Paraskevi at the harbour, built within a cave opening in the rock. The 17th century church of Aghios Nikolaos is built on the site of an Early Christian basilica, which in turn was sited on the ruins of a Roman temple. 28 kilometres east of Heraklion. Easily accessible from Heraklion by public bus service.